Lyft’s race to beat Uber to public markets culminated with a dwindling pop after shares started trading at $87.24 on the Nasdaq Friday before trailing lower in the afternoon and opening nearly 7% lower Monday to fall below its IPO price. But Lyft’s price action in its first days of trading matters little when you consider the company’s valuation nearly doubled in just nine months, jumping from $15.1 billion in its last private funding round back in June 2018 to nearly $30 billion at its opening trade. That kind of run up perhaps makes it easy to assume Lyft’s valuation has risen far too high, too fast, especially considering its $911 million loss registered in 2018 marked the largest ever by a U.S. company going public, according to S&P Global Market Intelligence. But when you compare Lyft to some of its newly public tech companies, its valuation doesn’t seem quite as crazy. As highlighted in a recent note from analysts with private share trading platform EquityZen, Lyft’s price-to-sales multiple falls below online sales platform Etsy and luxury fashion platform Farfetch. 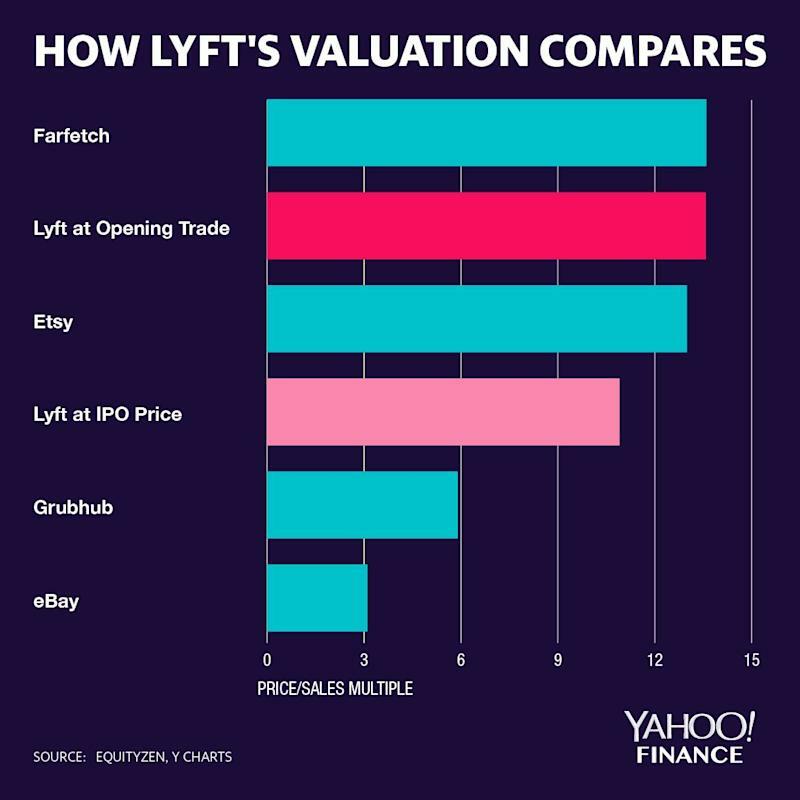 At nearly $2.2 billion in revenue last year, Lyft’s price-to-sales ratio is roughly 13.6, which compares to Etsy’s 13 and Farfetch’s multiple of 13.6. At it's opening price, Lyft's price-to-sales multiple is notably higher than other tech names, but it is also growing much faster. To be fair, there are some distinctions worth noting. First, unlike Etsy, both Lyft and Farfetch have yet to reach profitability. Second, Lyft’s revenue growth for 2018 was also an impressive 103% over 2017, which outpaced the rate of growth over the same time period for Etsy and Farfetch at 37% and 56%, respectively. Of course, a price-to-sales multiple is just one point in evaluating Lyft as a now public company. There are other factors at play as well in stacking the company up against other tech firms. Particularly with ride-sharing, as Wedbush noted in the firm’s first note that initiated coverage at an $80 price target, there are unique risks in the form of regulation and a giant competitor in Uber that controls more than 60% of the U.S. market. As early Lyft investor and founding partner at Flat World Partners Anna-Marie Wascher points out, that hasn’t stopped Lyft from eating away at Uber’s lead. Lyft now controls about 33% of the total ride-share spend in the U.S. compared to the low-to-mid teens it saw in 2016, according to data from Edison Trends. And despite being restricted from selling her firm’s stake in Lyft until a lock-up period expires, she explained on Yahoo Finance’s YFi PM that her firm wouldn’t sell anyway because of the growth ahead for Lyft. In his note initiating coverage on Lyft with a Buy rating, D.A. Davidson analyst Tom White urged caution for investors expecting Lyft to reach profitability in the short-term.